Ernesto Valverde played down the importance of Barcelona's search for a new No.9 ("I'm not frustrated, I know the club are working on it... We will see. It's not as easy as it seems") and also passed the buck on Munir's departure ("It was the club's decision"). The Barça coach began the season with six seasons in the squad, of which Malcom is almost and afterthought and Munir was invited to leave as his contract ticked down. Valverde has the untouchable Messi and Suarez and then the options of Dembele and Coutinho. Fewer options than anywhere else on the pitch, because another player who could adapt to a forward position, Rafinha, is out for the season. Four players to tackle all three competitions is crazy, which is why Barça are looking for someone to fill the gap their squad has. And no one is ruling out selling Malcom if an offer arrives from Chine. The January window is a chance to make subtle changes to the squad, but as the years pass it's taking on more importance. 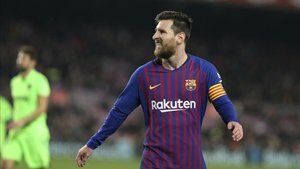 Barça have no Plan B after Messi and Suarez. Should they be criticised? No. Replacing those two is not an easy task. Each one is a star. Real Madrid, without looking any further, have been looking for a forward to guarantee them goals without any luck. Tottenham, meanwhile, have lost Harry Kane to injury and have no one to fill in for him. It's a risk you have to take. Barça have to die this season with Suarez and Messi. There's no other option. Managing their minutes in the Copa del Rey is the key to success in the Champions League.